Terry O'Reilly, host of the popular radio show Under the Influence, provides the best stories about smart marketing for small business. In Terry's gifted presentation, This I Know is more than applied business techniques. It offers a unique view of contemporary life through the lens of advertising. Skillfully revealing the machinations behind the marketing curtains, O'Reilly explains how small business can harness the tricks of the trade that the biggest corporations use to create their own marketing buzz. 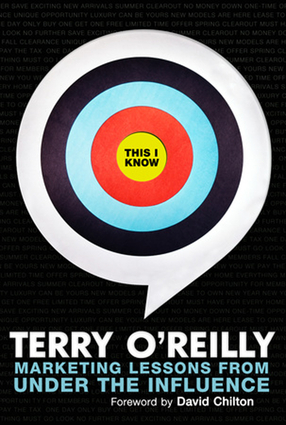 Terry O'Reilly is a phenomenon in the world of advertising and marketing. He is a practicing ad man whose current weekly half-hour show, Under the Influence, airs on the CBC network, Sirius, and WBEZ Chicago, and via podcast.